Anthony Michael Sneed is an artist who appears to be heavily influenced by those artists that have been contributing to Gallery 1988's 3G show over the years. 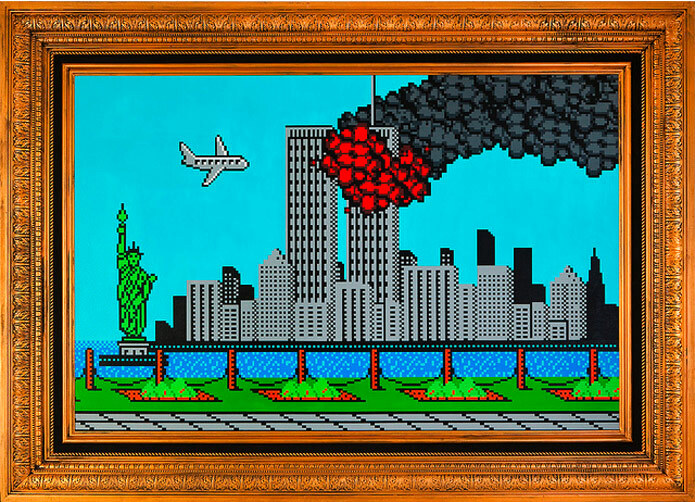 The juxtaposition of his controversial subject matter against a playful digitized/pixel style of painting that looks straight out of a late 80's Nintendo game draws me in. 80's babies such as myself are hit two-fold in the image above - positive childhood images reminiscing of Lil Mac's training run from Mike Tyson's Punchout, offset against the most destructive domestic terrorist attack on US Soil since Pearl Harbor. Check out the video below for some more images from the artists recent exhibit. To be honest - I'm not a huge fan of the artists #swag, a bit pretentious for my taste - but that's pretty standard. One thing pops taught me at a young age- you (almost always) need to separate the art from the artist. Anthony Michael Sneed - Hell for Hire from The New Pop on Vimeo.